Overview : Rainin Traditional Tips have a traditional conical design, designed to fit pipettes of all standard manufacturers as well as the traditional (non-LTS) pipettes of Rainin. Manufactured under clean-room conditions, these tips are 100% contamination-free, ensuring top performance by preventing experiment inconsistencies and failures. Continuous tapering and thin-walled construction give Rainin tips greater flexibility, a softer feel and a better performance than standard or beveled tips. Tips are BioClean: clean and fully automated manufacturing and packaging in clean room conditions. No human contact means no contamination. Tips are constructed with top quality virgin polypropylene material and a product of state-of-the-art manufacturing. The large selection of available sizes, packaging options and technical variations provides the ideal tool for every application. 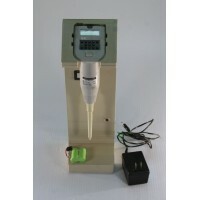 Description :Title : Rainin EDP 1000uL Single Channel Electronic Pipette W/ Rapid Charger NEW Batter.. Description :Title : Rainin EDP 250 UL Single Channel Electronic Pipette W/ Rapid Charger NEW Batter..